Button hook zipper pull has wide rubber handle and is easy to hold onto and maneuver. 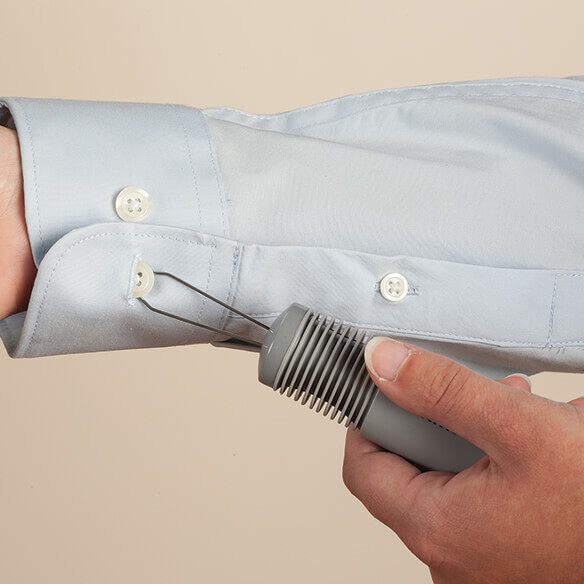 Button aid has a spring loop that pulls buttons through holes one-handedly. Zipper aid grabs zipper tabs to slide zippers up and down with ease. Enables you to get dressed without assistance; 8 1/2" long. I had surgery on my hand and it is in a cast. I ordered this and it makes buttoning blouses so much easier. The hook to help with zippers is a great feature as well although I have not yet used that part. This is very helpful for dress shirt sleeve buttons, if you have arthritis. It makes so much easier dressing in the morning. Most handy for the top button of my husband's shirts. My fingers had trouble with the tiny buttonhole getting the button to go in and stay in. Its a breeze with this buttoner. My friend saw it and instantly wanted one for her husband. This repeat order is for her. Anyone with dexterity problems, mine was Parkinson's disease. Fell apart the first time I tried to use it. Can't use it when it falls apart. Not worth the money. I am having trouble with buttons lately. I am sure zippers will be my next problem. It works. Can’t find this type of item anywhere else. It use to be readily available in many different styles. But not anymore. Because I don’t have the use of my right arm and I have clothes with zippers I want to wear. my dad has a hard time buttoning his shirts, and he always wears button down shirts .... so this is a constant issue. I PURCHASED THIS BECAUSE I NO LONGER HAVE FEELING IN MY HANDS AS A RESULT OF MY WIFE'S ASSING AND MY NERVES. Husband has trouble with buttons & zips. This instrument helps my husband get dressed. However, I know this one will break in a while (the metal will pull out of the handle). This is the only "pull" i found in any book. I have numbness in my hands. It works. It's easy to use. Need the assistance with buttons. Clothing has too many tiny buttons. Have watched relative use this. I presently have a similar one and it's works great, Wanted a spare. Husband has a lot of trouble with small buttons. This item was just what he needed. He no longer needs my help to button his shirts. I highly recommend this item. is this a zipper pull also? BEST ANSWER: Yes, it is a zipper pull, also. It is a big help for myself and my husband. BEST ANSWER: You stick it thru the button hole, then over the button. Then pull the button thru the hole. Works fine. Sometimes it takes a little maneuvering with a tight button hole. You put the end of attachment over the button and pull it through the button hole. Both my husband and I have one. Very handy! Did not work without a lot of work to button a blouse but it did finally get the job done. Is this strong enough to work on jeans? It looks a bit flimsy. BEST ANSWER: I cannot answer that specifically for jeans, as I do not have any, and so far my husband does not have trouble buttoning anything except those neck buttons. My experience is with the collar buttons of his dress shirts, and the button hook works marvelously for the tight neck button. It has to be flexible so that it will fit through the button hole, hook the button, and pull it through to button it. I have used it for a year of Sundays and more, and it shows no signs of weakness for that purpose. It works for buttoning the inner button of my dress slacks which is so far around to the side that I have trouble buttoning it. Once buttoned, the zipper works more smoothly. I bought this for my uncle who has great difficulty with finger dexterity. He confirmed he has tried with the blue jeans and it does not work. However he does appreciate how it works on a button down shirt. Hope this helps. Hello, I think this is sturdy enough for jeans; It has an easy grip handle and the hook is vey sturdy! enjoy! Only used on shirts. Sorry.